The Talking Box: The Only Cab that Pays YOU! The Only Cab that Pays YOU! This is a new one for me, in that I had never actually seen Ca$h Cab. I had heard about it, but since most of the things I've been told have been negative, I felt the need to see for myself what it's all about. (and, after three episodes, I think I've got a good grasp on it.) I think that the idea is pretty interesting, and I'm kind of jealous that I never stepped into a Ca$h Cab when I frequented NYC in 2009 and 2010. But, I'd be much angrier if I lived there and took taxis on a regular basis and never hit the Ca$h Cab, LoL! The show goes pretty quickly since multiple groups of people take the cab during an episode, which I like. Brief history: The show originated in the UK in 2005, but many countries have since come up with their own versions. 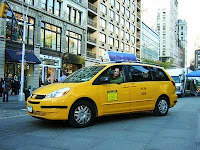 The US version is set in both New York (hosted by Ben Bailey, seen right) and Chicago (hosted by Beth Melewski), and over six seasons have aired so far. There are also some recent episodes that take place in Las Vegas (which, from personal experience, tend to be fairly short rides!) Adam Wood takes the credit for the design of the game, which airs on the Discovery Channel in the US. Bailey has been nominated for 3 Daytime Emmy awards, winning one. The show itself has also won the Daytime Emmy for Outstanding Game Show in 2008, 2009, and 2010! Notable changes to the way the game is played: Originally, the first four questions earned you $25 each, then the next 4 were $50 each, and everything after that was $100 each. 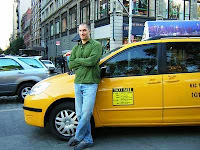 After the spin-off Cash Cab: After Dark was around a while, the daytime version switched to their payout layout: $50, then $100, then $200. There are also random games that are "Double Ride" with levels being worth double those amounts! Also, up until Season 3 only one Red Light Bonus was given per game, but since then it tends to be at least two, allowing for accumulations of $1,000+! And, they have changed the call signs of the cabs since the start of the show. 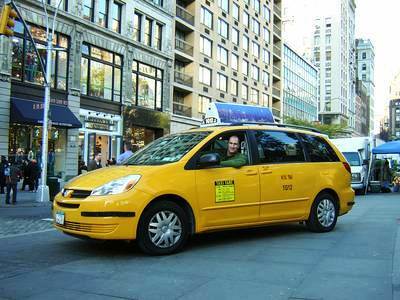 If you're on the lookout, 7N78 in NYC and 4472 seem to be the ones used on the Toyota Sienna cabs used for Ca$h Cab! Special contestants: As with many other game shows, there have been some celebrity editions, playing for charities. Vince Vaughn, the Mayor of Las Vegas, and Penn & Teller. Favorite Rounds: From the limited footage I have seen, I think I like the Red Light Bonus rounds the best. I like games where you're trying to name a lot of one thing. They are hard, tho! My take: Heck yeah! I mean, I understand that I might be in a hurry and not want to participate, but unless it was a flight or a show, I'm pretty sure I could give up being on-time to play this game! Plus, random trivia is my specialty, hehe! Though I am a bit fearful that I'd do horribly on political and movie questions! But that's okay, because I'd likely have my husband with me in Vegas or NYC and he knows political stuff. Do you ever watch Ca$h Cab? Do you prefer NYC or Chicago episodes? Who would you want with you when you entered the cab?